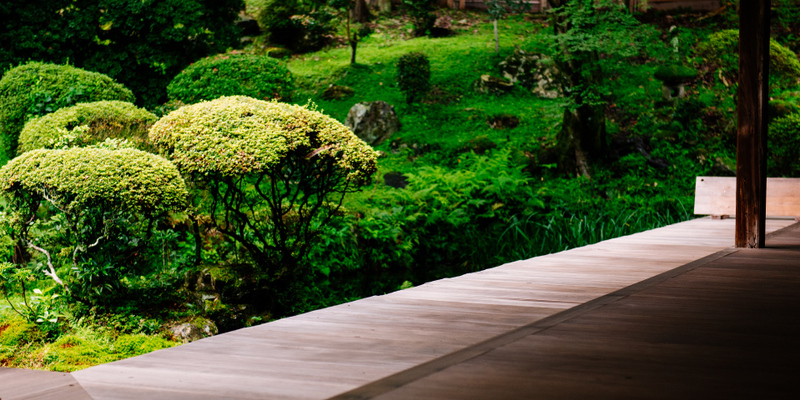 Kangakuin was established as a scholar of Miidera by the Buddhist priest Koson in Eno 1 (1239). 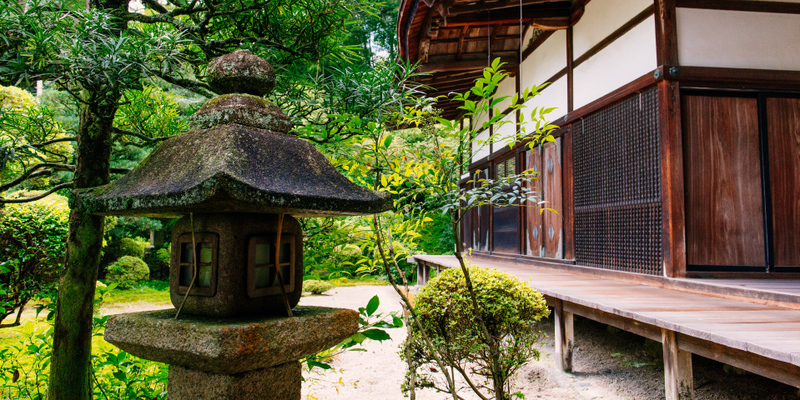 Koson is a famous scholar who received devotion such as Kameyama Emperor and Hojo Tokiyori, and the School of Recommendation has been referred to as Tendai’s “famous room of scholarship” because of the excellent priests who lived there since the establishment. Existing buildings were rebuilt by Mori Terumoto (1553 – 1625), one of the five elderly people of the Toyotomi administration, with Hideyoshi Toyotomi serving as the owner of Keicho 5 (1600). Mori family has a deep relationship with Miidera temple from the era of Mori Motonari,Terumoto also donated the Issaikyo-zo (Important Cultural Property) which was in Kokuseiji-Temple in Yamaguchi city (now Tousyunji-temple) by Keicho 7 (1602). 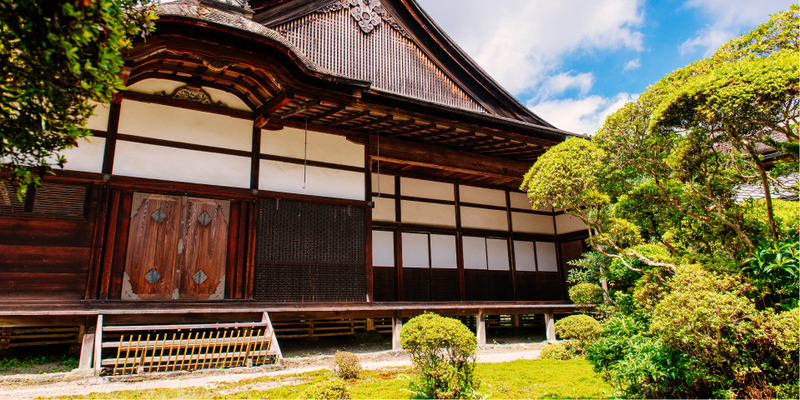 It is designated as a national treasure as a representative remembrance of the early “Shoin-zukuri” which is representative of the Momoyama period. The scale is between the girder spaces 7, between the girder bars 7, the layout is larger than the three-row nine rooms and the Buddhist clerk’s guest house, and it conveys the style of “Shudenzukuri” which is typical of the samurai house of the Muromachi period. 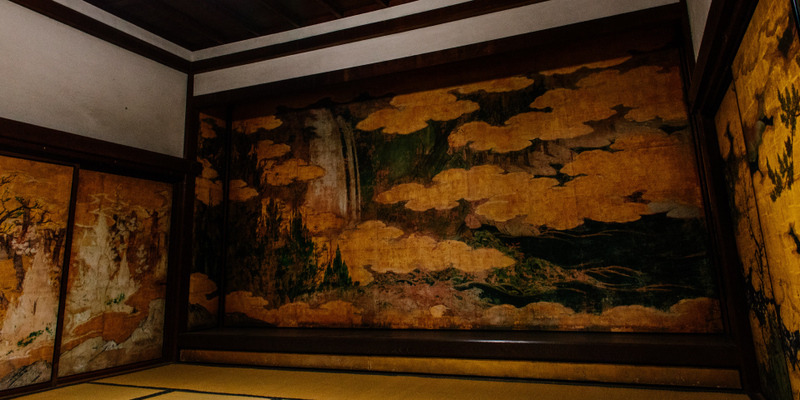 In 1985, Room1 was restored to the Metropolitan Museum of Art in New York, and it helped to convey Japanese culture. From room 1 to room 2, there is a splendid barrier picture (important cultural property) by Mitsunobu Kano, one of the best masterpieces of Momoyama painting. Mitsunobu is the eldest son of Kano Eitoku (1543-1590 years) representing Momoyama painting. I worked with my father under Oda Nobunaga and Toyotomi Hideyoshi, but many of them have been lost, and the work of this hall is a masterpiece of knowing his style. In room 1, flower trees such as plums and cherry blossoms are drawn for the four seasons by the color of gold leaves, and flower and bird drawings such as mountain birds and ducks are drawn in the room 2, and each one has a unique fresh feeling of the changing season and the natural mountain It expresses the elegant and elegant space unique to Mitsunobu expressed. 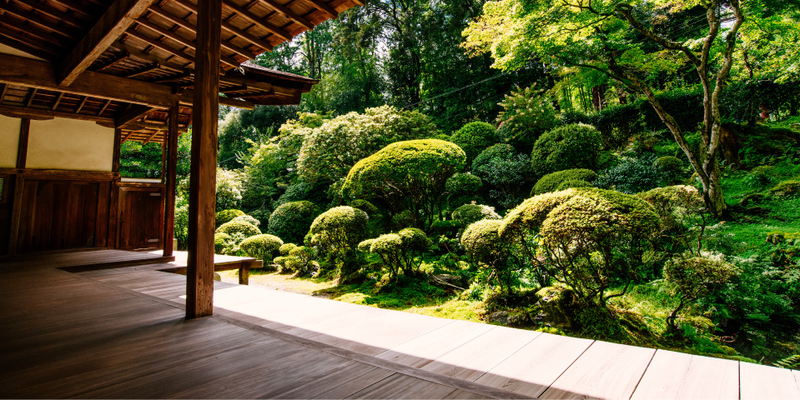 When I turn my eyes from the inside of the room to the outside, a spacious space consisting of broad veranda and falling edge is opened, and it continues to the garden with a long narrow pond as it is. “Andromeda” and “azalea” etc. are arranged by mingling with big trees such as cedars and cypress. Among them, the treasure tower placed in the west corner is a unique Kamakura era’s goodness that Kasaishi stone has a triangle. We do not make public of Kojoinkyakuden and Kangakuinkyakuden, but you can enter in advance by applying. On the day, the temple staff will guide you in both buildings. 600 yen / person (with postcard 2 leaves) ※ Entrance fee is required separately. – Limited to applications with more than 3 people. – Because of circumstances of legal events, it is possible that you can not worship. – Kangakuin’s Ooyuka, Mairado is high definition digital reproduction.